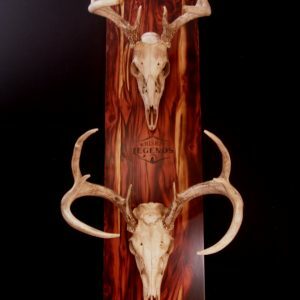 Proudly display your antler mount on a plaque that you finished! The Buck Hunter’s Kit comes with all of the materials needed to create an antler mount that you can truly call your own. The precut, unfinished, ¾ inch select Ash plaque is sanded smooth and is ready for you to stain or to finish in its natural state. The plaque comes predrilled and is ready for the mounting form and flush mounted hanger. 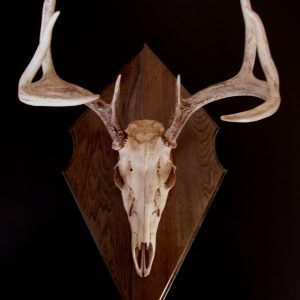 All you have to do is stain and/or finish the Ash plaque, attach the hanger, and mount your antlers. 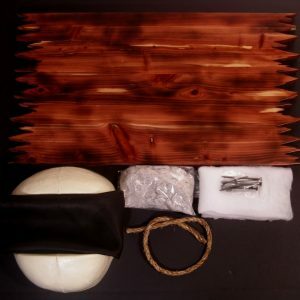 This kit makes the perfect gift for the young hunter or the do-it-yourselfer. The Buck Hunter’s Kit is just waiting for your stain and trophy rack! -An independent antler form-The antlers are mounted to the form, and then the form is attached to the plaque. This is the proper way to mount antlers. When ordering, the Standard antler mount kit includes all materials listed above. This kit is also available in the Desire Series for her. The Desire series converts each antler mounting kit with a white faux leather antler mount form cover and a gold colored finishing rope. Plaque measures: 14.25 X 10.5 Inches. Made in the U.S.A.